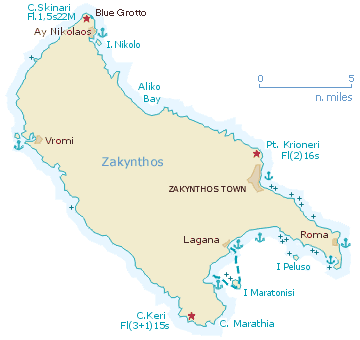 Zakynthos - Ζάκυνθος (Italian Zante), besides Kythira the southernmost island of the Ionian Islands, lies off the west coast of the Peloponnese. The western half of the island is occupied by a karstic plateau rising to 758 m, the eastern half by a fertile and intensively cultivated alluvial plain with a luxuriant growth of vegetation. 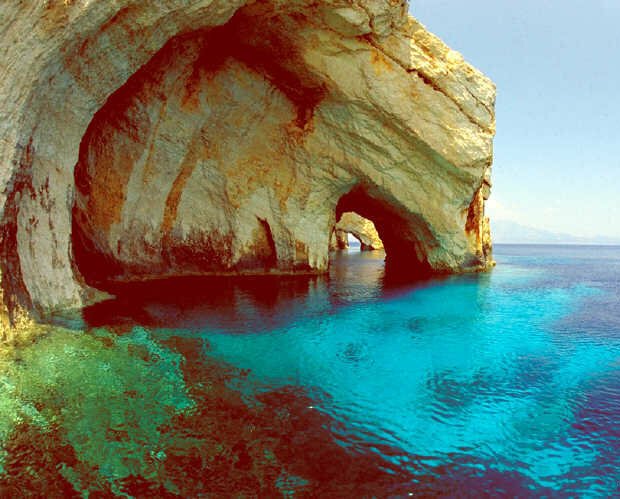 With its beautiful scenery and excellent bathing beaches, Zakynthos is very popular with yacht charters and tourists in general. Since the time of Homer the island has been known by the name it still bears, said to be derived from the wild hyacinth (Hyacinthus orientalis L.). Settled at an early period by Achaeans and Arcadians, it soon developed into a centre of trade and seafaring whose in­fluence extended as far as the Iberian Peninsula, where it found­ed the col­ony of Za­kan­tha, later known as Saguntum. It was occupied by the Turks in 1479 but recovered two years later by the Venetians, who held it until 1797. The island has preserved an Italian and Venetian stamp, yet its eventful history (Vandals!) and major earthquakes of 1515 and 1953 destroyed most old buildings. 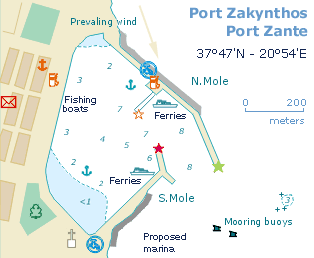 The port of Zakynthos provides good shelter from the prevailing NW winds. With a strong southerly it is better to anchor in the SW, though clear of the turning circle of the ferries. Care should be taken to avoid the little reef (marked by a red buoy) just east of the entrance of the harbour. Note also the few unlit mooring buoys south-east of the harbour. The proposed marina is still not finished. Above the town are the remains of a Venetian Castle (view), which is believed to have collapsed in the 1515 earthquake. 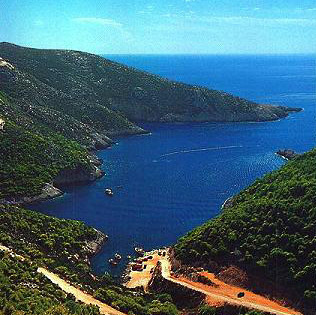 The Vromi bay is a deep inlet and the only anchorage at the west side of the island. In NW-W winds it provides good shelter, but be aware of kat­abatic gusts. At the left of the picture is another little bay hidden behind the hill. There is new road nearby, which pro­vides a way to obtain provisions.